I meet many people in my classes who are sensitive to gluten, a hard-to-digest protein found in wheat, rye, barley, farro and spelt. Perhaps you aren’t gluten-intolerant, but are wisely monitoring your intake of it. I’m a big advocate of “include a wide variety of foods in your diet” and “everything in moderation,” especially when it comes to eating gluten, which is very inflammatory to the body. However, one food that is tough for many gluten-sensitive people to give up is traditional wheat pasta. The good news is that there has been an onslaught of gluten-free products on the market in the last several years, although many of the new foods are processed and no better than their wheat-based counterparts. 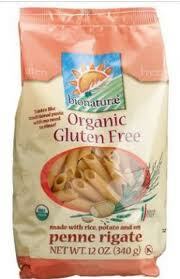 Regardless, if you can’t eat wheat, it’s nice to have a few good choices for gluten-free pasta. I’ve experimented with many of them and I’ll give you my take right here. The main trick to tasty gluten-free pasta is in the cooking. It has a tendency to stick together if you don’t stir it regularly, especially immediately after pouring it into the water. Also, it can go from al dente to mush very quickly, so test it earlier than the package directions indicate. Brown rice pasta: I like the Tinkyada brand and the house brand from Trader Joe’s. Both are organic and are a close second to Bionaturae. Do not go by the package directions on the Tinkyada bag! Start testing the pasta after it has been cooking for 8 minutes, but it should not take longer than 10 minutes. Tinkyada is about $3.69/pound and Trader Joe’s is about $2.00/pound. There’s also another brand of rice pasta called Notta Pasta, which has an almost cult-like following, but it’s not organic. I have see it on Amazon.com. Believe me, there are many more brands, but some are so ridiculously expensive that I’d rather eat plain rice. Quinoa pasta: I have tried Ancient Harvest and Andean Deam, both organic and available from Whole Foods or amazon.com. Ancient Harvest is made from a mixture of a corn flour and quinoa flour. Andean Dream is a blend of rice flour and quinoa flour from royal quinoa, a variety that is very high in protein. These brands cook at different rates and different shapes have different cook times, as well. I prefer Andean Dream over Ancient Harvest because I don’t love the corn flavor from AH. Rice noodles or sticks: These translucent rice flour noodles are delicate and versatile. I’ve seen them in Asian grocery stores and some supermarkets in the Asian section. You need to reconstitute them in warm water for about 20 minutes and then cook for another minute in boiling water. Soba noodles: Most soba noodles are made from a blend of wheat and buckwheat flours, but you can find 100% buckwheat soba noodles by Eden Organic. They can be very tricky to work with if you aren’t attentive. Be careful of the pot foaming over and the noodles sticking together. I love the earthy, almost mushroomy flavor of all-buckwheat soba noodles, but I use them mostly in Asian noodle salads or soups. Very expensive, about $7 for a half pound. Ready to try some out? Here are some great recipes already on my site: Basil-Parsley Pesto; my childhood favorite, Pasta alla Checca; or clean out your fridge with Pantry Pasta. 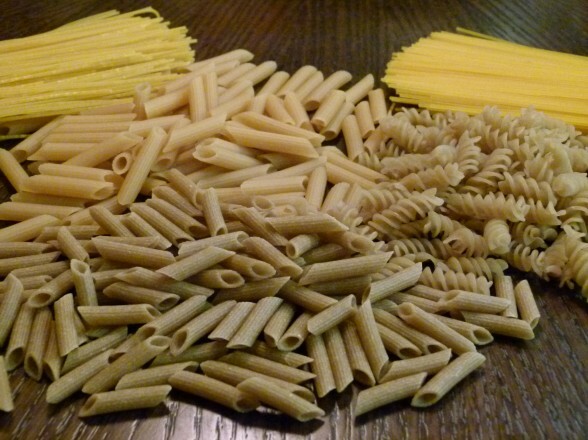 I’d love to hear about your experiences with gluten-free pastas. Favorite brands? Good tips?